Tonight we did boneless pork chops on the grill. Low and slow was the setup for tonight. Kept the grill between 250 - 300 and cooked them for 90 minutes one on side. After 90 minutes, flipped and started lathering on BBQ sauce for another 30 minutes. All told, did them for about two and half hours. We could have left them on longer and turned down the grill a little more to get it below 250, but we were hungry and decided to take them off. They turned out great! Not as tender as I was hoping, but good flavor. Carrie was concerned about the BBQ sauce I was using, but she liked it in the end. Happy with how they turned out. This was the sixth cook from the Big Green Egg. Another low and slow cook with another one planned for Sunday. 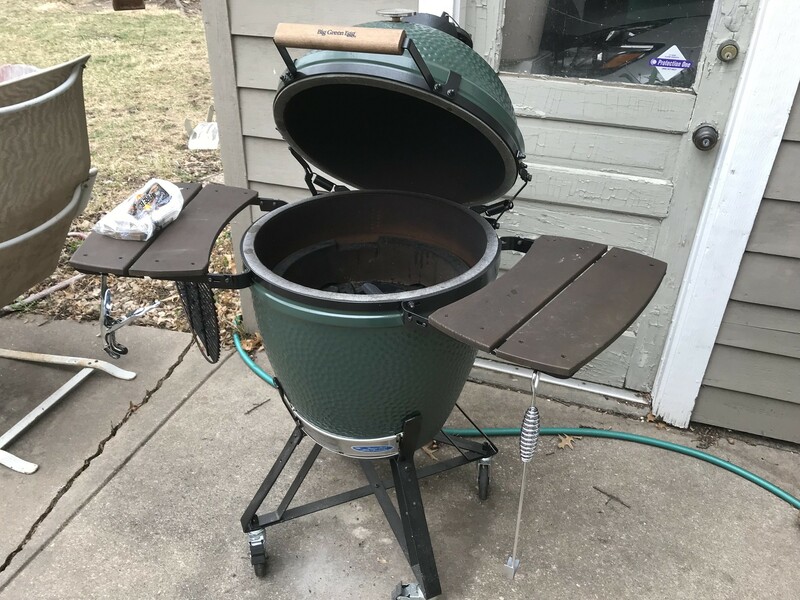 Planning on doing our first brisket on Sunday, so I will be spending time on the Big Green Egg EGGhead Forum gathering hints and information. I see another person just posted that they were doing a brisket and getting a lot of pointers from others on the forum. I believe that will be about an eight hour cook, but need to research further before Sunday. Starting the fire tonight went much better. Got the temperature hot within about 30 minutes. Stopped by Patio Pool and Fireside on Saturday to pick up another bag of lump along with a new tool to scrape the grill between cooks. The scrapper I have had few a few years is falling apart and the high temps from a week ago (Fifth Grill Opened up Flame and Cooked Steaks) made it about disintegrate from the heat. Bristles falling out of it and no longer useful. Looking forward to another cook on Sunday. Until then, I will be working on homework with two forum posts due Friday night and a paper due that night too. A lot to do and instead here I am posting an update on what I cooked tonight. Have a great week and I plan to post pictures of preparation, cooking, and final product Sunday evening. Following the first four grills of keeping the temperature under 350 degrees, we were finally able to open it up and grill steak. We are actually doing our fifth and sixth grills tonight with another pork tenderloin going on here shortly. After getting the grill temperature up to between 600 - 650 degrees, I realize now I should have done the pork tenderloin before the steaks. Taking a long time for the temp of the grill to come down so we can do the pork tenderloin. At one point while getting the grill ready, the temperature went all the way around the dial which I am estimating was a 950 - 1000 degree temperature. I had gone inside to prepare mushrooms for the steak and came out and realized the temperature continued to climb after I went inside. Hoping that did not cause any damage as I brought it back down closing vents further and the temp dropped to around 650 - 700. Doing additional fine tuning with the top and bottom vents I was able to keep it between 600 - 650 degrees. Still taking me a little while, it seems, to get the grill started. I know some people on the EGGhead Forum suggested getting a weed burner to start the grill. I have not done so yet and using fire starters we got from the shop. They work, but it takes about 25 - 30 minutes to get the grill ready to cook. After finishing the grilling of steak that took two minutes each side, it seemed odd it took longer to get the grill ready than it did to actually cook the food. Although we are doing another cook tonight with the pork, but seemed odd. I am sure I will get the hang of starting the grill and maybe it will get faster. Using advise I got from the forum, I did leave the lid open until I made sure enough lump was lit. That did seem to make the process better and got the temperature up. I will continue to monitor and fine tune the process of lighting and see if I can increase the time it takes to get started. I snapped a picture of the temperature gauge simply because it got so hot. I could not believe how hot it got. I had read descriptions of the heat that Big Green Eggs can get extremely high temperatures. As I mentioned earlier, the temp got so hot that it basically circled around and 950 or 1000. The needle on the gauge was pointing at the 200 mark when I closed vents and started taking the temp back down. Again, hopefully I did not cause any issues for the Egg or the gauge by getting it so hot. The plan was not to get that hot. I thought I had it pegged at the 650 - 700 mark, but it started going up and got very hot. As they warn, I did the burp when opening it which is good as a ring of flame came out each time I opened it. I had an oven mitt on which was good because it was very hot even when I got it down to the temp I wanted to cook at for the steaks. Impressive! I just took off the pork tenderloin. Took a while to get the temp down so the pork did not burn. Looks like it turned out great! Cooked for 14 minutes each side to start. The temperature was about 150, so left on for another minute or two each side. We will have this over our salad tomorrow night for dinner, so decided to take it off before it got to 160. Leave it juicy and then hopefully will not dry out when we heat it up tomorrow. Impressive evening of cooking. Had a good day! Got up and went for a run. We went shopping and then came home to study a little bit. Finished my reading for the week, but struggling to get writing done for this weeks posts. Hoping to knock them both out tomorrow. I hope everyone had a great Labor Day and long weekend. Have a great rest of the week!